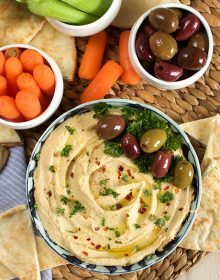 dip some veggies or pita into this delicious and easy hummus! Drain the beans through a wire mesh sieve and reserve the water from the can. Set the water aside and peel (or pop) the beans from their skins by squeezing them between your thumb and index finger. Add the beans to the bowl of a food processor and process until they are crumbly. Add the garlic, tahini, lemon and reserved water. Process the ingredients until they start to become smooth and then slowly drizzle two tablespoons olive oil while the processor is still running. Continue to mix until the hummus is smooth and creamy. If necessary, add the remaining tablespoon of olive oil to achieve the correct consistency. Transfer to a bowl or container and drizzle with olive oil. Note: Hummus can be stored in an airtight container for up to 5 days in the refrigerator.